Christian Mysticism and New Age writings by Rosicrucian taught occult scholar. 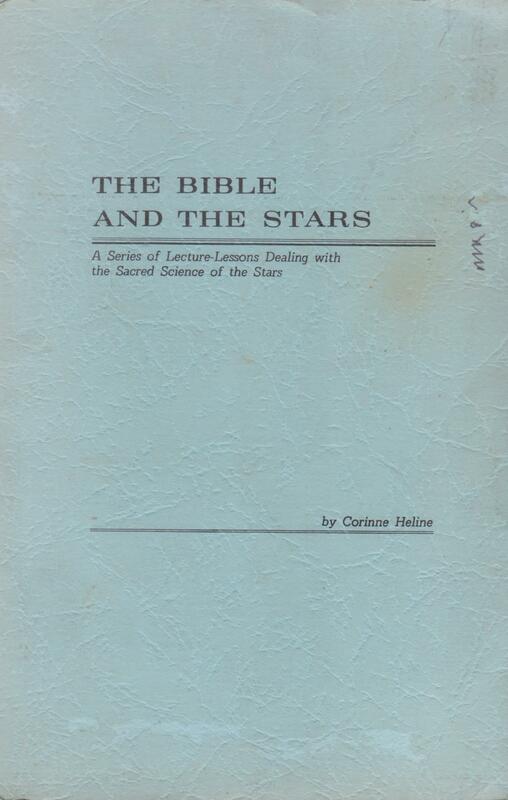 Corinne Heline (1882 -1975) was an American Christian mystic and occultist who received a classical and religious education. 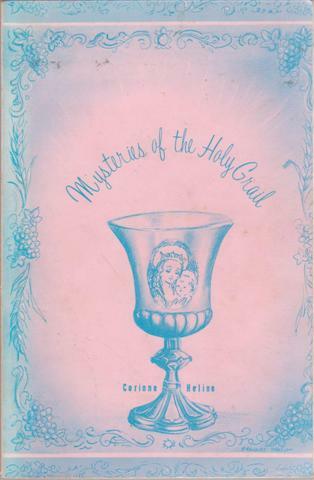 Rosicrucian Initiate Max Heindel became her teacher at Mount Ecclesia, where she met Theodore Heline, who became her husband in 1938 and undertook the publication of her mystical and occult writings. Her magnum opus The New Age Bible Interpretation (1954) in seven volumes was followed by many other works interpreting the ancient wisdom. 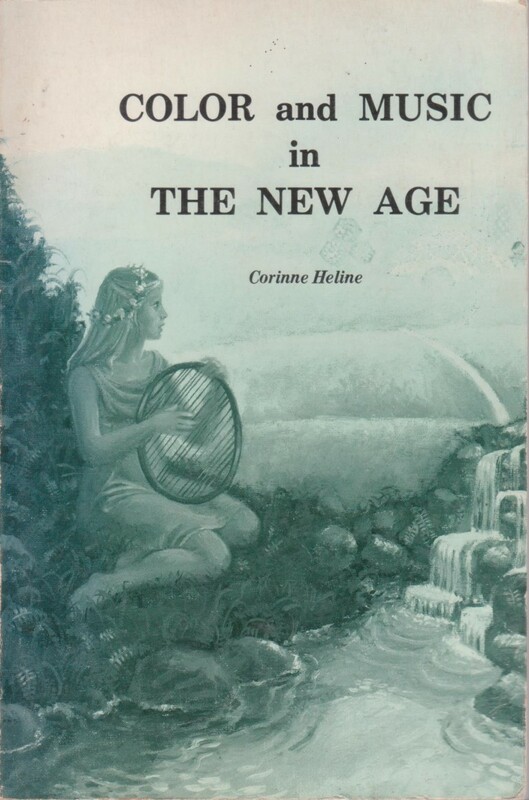 A pioneer in the Age of Aquarius, Heline joined the New Age Bible and Philosophy Center at Santa Monica, California, which took the motto "Devoted to studies designed to aid the modern seeker to a spiritual reorientation in the Light of the Ancient Wisdom." 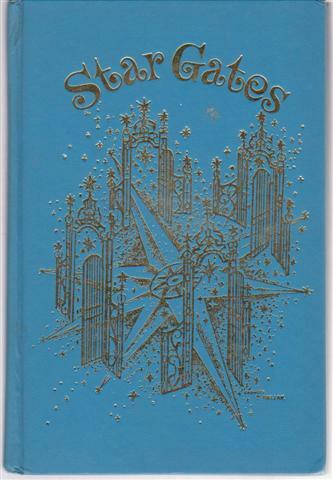 A book about the Sacred science of the stars. Lessons are 1- Sun Moon and Planets. 2-Abraham Isaac and Jacob. 3- The Ten Commandments 4-Aarons breastplate 5- Old Testament Studies 6-The Story of Samson 7- Legend of David and Saul 8-Ecclesiastes Astrologically considered 9-The Prophets 10-The Gospels 11-Twleve disciples and the book of Acts 12-Book of Revelation. 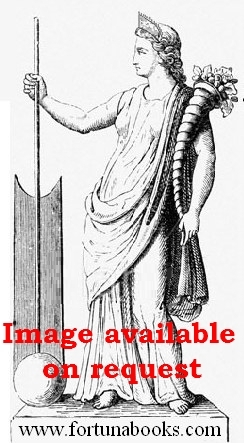 Judeo-christian traditions interpreted astrologically. G+ blue printed paper covers with some surface rubbing or scuffing, and a small pen scribble. Spine ends starting to split. New Age Press 1971, 128pp. The whole solar system is one vast musical instrument, spoken of in Greek mythology as "the seven-stringed lyre of Apollo." 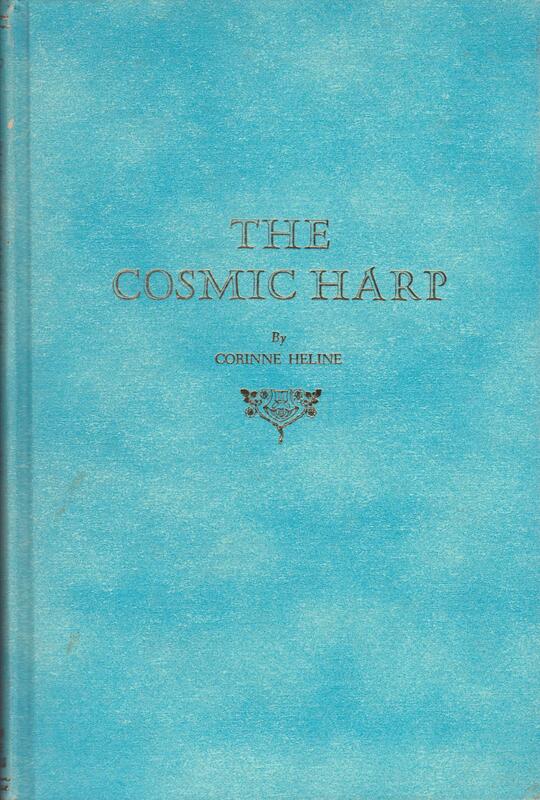 Corinne here describes the Zodiacal correspondences annd qualities as perceived by esoteric means. She relates spiritual hierarchies and a particular musical composer to each zodiac. VG+ hardback with no dust jacket. name to blank fly leaf. New Age Press Inc. 1969, 99pp. 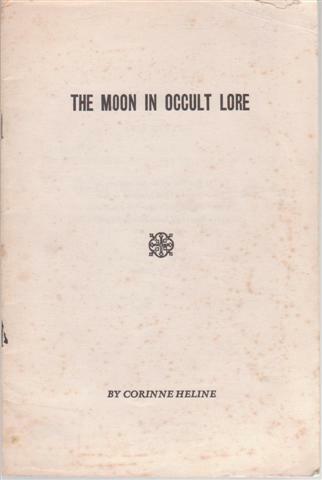 Five chapters by Corinne Heline about the Moon within Esoteric Christianity. $15 B/letter rate international postage. 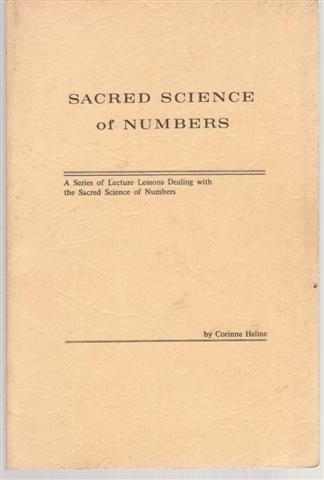 Sacred Science of Numbers, a series of lectures. A series of lectures covering the numerology of the numbers from one to thirteen. VG- softback, pen notes to final blank page and ticks to list of titles to inner rear cover, top of fep clipped. A companion study to Healing and Regeneration Through Music. 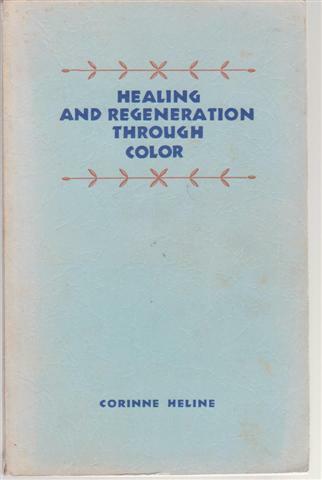 Colour Therapy and healing. G+ softback, sunned spine, top of fep trimmed, some neat ruled pen underlining. $20 B/letter rate international postage. New Age interpretation of the Seasons on the Solar Cross, includes meditation for each Archangel at the solstice and equinox rites. New age astronomy and astrological theories. VG- hardback with gilt design to cover, top of fep clipped, one page has printers error restored by pasting new page over the top. 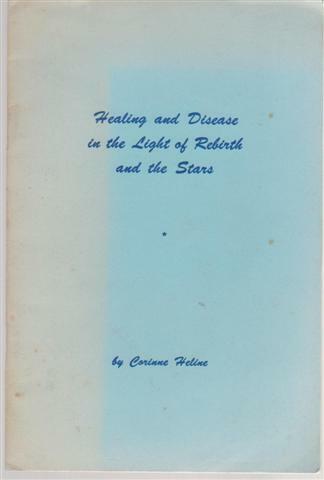 Also, Healing and Disease in the Light of Rebirth and the Stars, this work collects metaphysical works formerly published as separate booklets. Occult research into the archaeology and history of the Grail, Initiatory Cycles within the Legends, The Cycle of dissolution, Galahad-Parsifal cycle, the modern Grail Knight and His quest. New age occult interpretations of the myth cycle. G+ softback, perfect bound but the glue is weakening so pages may be about to detach but not yet. New Age Press 1973 second printing, 128pp. Old Testament vols 1, 2, 3. Christian New Age mysticism interprets the Old Testament chapter by chapter unveiling the occult truths behind the allegories, volume 2 addendum on Masonry and Esoteric Christianity has much information on the Knights Templar and Freemasonry and alchemy (33pp). VG hardbacks with no dust jackets. Vol 1 and 2 dulled titling, rubbed spine, vol 1 one word pen notation noted, vol 2 rubber name stamp and a few lightly creased pages at rear, vol 3 tidy and blue rather than black cloth. $120 ask for quote as approximately 3 kg packaged. New Age Press, vol 1 1958 second revised edn 534pp + plates/ vol 2 1946 first edition 470pp/ vol 3 1955 copyright may be later printing, 536pp. New Testament vols 4, 5, 6. Christian New Age mysticism interprets the New Testament chapter by chapter unveiling the occult truths behind the allegories. VG hardbacks with no dust jackets. Vol 4 and 5 have top of fep removed, second copy of vol 4 and 6 have name stamps. One of the copies of vol 4 has stamps from the library of the Christchurch Societas Rosicruciana In Anglia, vol 6 has rubber name stamp and is black cloth not blue. $40 each C/C, sold individually. 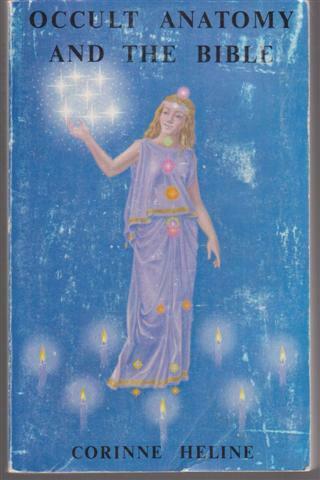 New Age Press, vol 4 1969 third edition revised/ vol 5 1976 fourth edition / vol 6 1970 third edition. Color and Music in the New Age. Color significance of the Zodiac Signs / Mystery of White and Black / New Age developments / Color therapy including Psychology / color and music for the Four Sacred Seasons (sabbats / Equinox and Solstice) / Inner Plane Ceremonials / Occult effects of music including studies in Reactions to Wagner's Valkyrie. VG softback with light wear, name to fep. 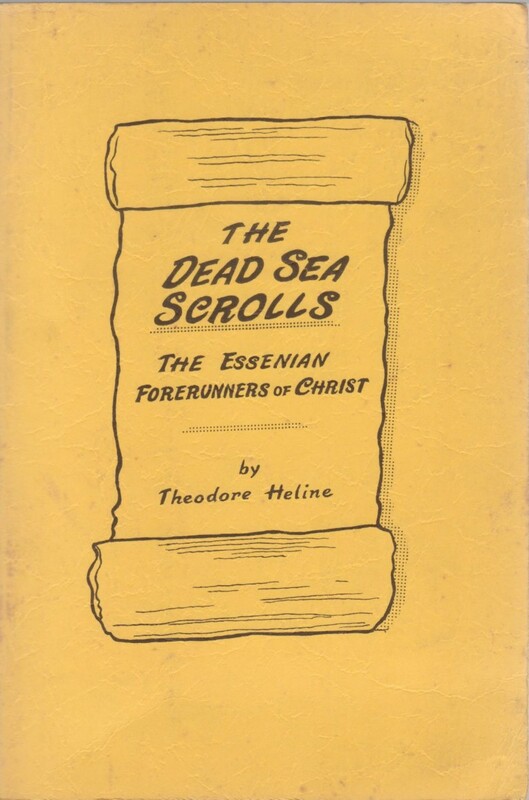 A discussion of the discovery and meaning of the Dead Sea Scrolls and the light they cast on the Essene communities of Jesus' time. VG- softback, top of title page clipped. New Age Press 1973, 79pp.